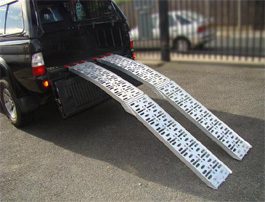 Pair of aluminium folding ramps which are ideal for transporting lawn mowers, quad bikes etc. Each ramp is 225cm x 31cm. Combined weight capacity of 680kg.